When starting a blog one of the first things most people are going to start thinking about is how they can make money with their sites. While you might be better served by doing other things like building content and backlinks to build up your traffic first, having a monetization strategy is definitely an important piece of the puzzle if you plan on making money with your blog. When I first started blogging seriously in 2008 I didn’t really know what revenue sources were available to me as a blogger. About the only things I knew about were Adsense and CPM (cost per thousand) ad banner types. 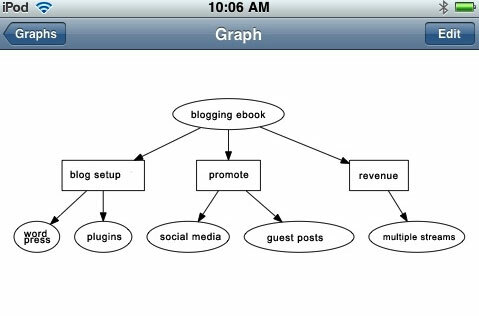 What I didn’t realize is that there are a plethora of other ways to make money with a blog. After about 6 months of blogging, and a lot of research I realized that there are a ton of ways you can make money with a blog, and it wasn’t just Adsense. Pay Per Click (PPC) Ad Networks: You can make money with pay per click ad networks along the lines of Adsense and Chitika. These types of companies will pay you anywhere from pennies to dollars every time someone clicks on one of their ads on your site. Google Adsense is by far my biggest money maker currently – and can be a good source of income even for newer bloggers. Private Ad Sales & Sponsorships: Selling your own advertising space can be a very lucrative monetization method, mainly because it allows you to cut out the middle man (third party ad networks) and keep 100% of all the money you make instead of just getting a commission from a network. Of course you have to do the hard work of selling the ads too! clicks, but instead pay you each time their ad is served. So if they pay you a $1 CPM, you’ll receive $1 for every thousand ads served. Finding a premium network for your niche that pays a high CPM is key to making good money with this. Affiliate And Referral Networks: Companies and individuals are more than willing to pay you if you can get someone to purchase their product or sign up for their service. It usually works best when you promote products you actually use and believe in. Usually a company will pay you a percentage of a sale or a flat fee. It can be quite lucrative if you do it right. Promoting these affiliate type offers does the best via reviews or via an opt-in email list. ﻿Referral and GPT Networks (Get Paid To Websites): There are quite a few sites out there that will pay you to fill out surveys, sign up for trial offers, buy products and refer new users to the programs. I’ve signed up for several of them, and found that the real money is to be made in referring new users. One example that has worked the best for me is Cash Crate. Creating Your Own Product To Sell: A lot of bloggers will diversify their income by creating their own products that they can sell on their site. Things like creating their own e-book (like the one I’m selling! ), online classes, selling a service and membership websites have all become very popular. Text Link Ads: Some newer bloggers find that once their site gets a page rank above zero, they’ll start getting offers from other sites and individuals who want to buy a text link ad on their site. While you can make some good money doing this, I have chosen not to partake in text link ads because Google has stated that they don’t like them, and it’s possible at some point sites that sell them could be docked in the search engines. And you NEED search engine traffic to be successful. So seller beware. Sponsored Reviews: Some companies will pay you to review their products or to do a sponsored post. Just make double sure to post a notice that these posts are sponsored as required by the FTC. Paid Writing Positions: Once you’ve built up some content on your own site, sometimes higher profile sites will offer to pay you to write for their sites as well. Your blog can stand as a resume of sorts for those looking to hire writers. Selling A Service: Some people will use their site promote a service that they’re offering. For example, you may offer consulting services via your blog, or maybe you offer design services. Bonus Idea – Sell Your Blog: I know some folks who enjoy the process of building a blog, but don’t want to continue doing it long term. Instead they build the site up to a decent amount of traffic and content, and then sell the site itself! So those are a few of the ways I’ve found to make money with my site – although there are other things I’ve done as well. What it really comes down to is that your options for making money with your site are only really limited by your creativity. The key is to diversify, and create multiple streams of income via your site(s). That way, if one source of income dries up, you’ll still have others that you can fall back on. Do you have other ideas for making money with a blog? What strategies do you use for monetizing? Tell us in the comments! When you start out on the adventure of writing a blog, the first few weeks can be a lot of fun, and the ideas for great post topics will flow from you with relative ease. New ideas just spring to mind out of nowhere. After you’ve been doing it for a short while, however, I’ve found that ideas start getting tougher to come up with, and you’ll often need to be a bit more creative in finding things to write about. You may need to find some creative inspiration. I’ve been writing 5-7 regular weekly blog entries for 3 years now, and as such I’ve had plenty of time to run out of ideas, and I’ve had to be creative in finding things to write about. Here are some hints and tricks that I’ve used in order to come up with ideas for content for my blogs when the well is running dry. There are a lot of places to look to for inspiration when trying to come up with ideas for blog content. Here are a few that I refer to. What are others writing about? : While you never want to steal other people’s content, it’s definitely OK to be inspired by what they’re writing on their site. Perhaps you’ve seen a couple of popular sites writing about a certain topic in the news. You might consider writing about it as well, but putting your own spin on it. I always have a ton of other sites in my RSS reader to look to for inspiration. Keep an idea file: Keep an idea file handy with ideas for future posts. Whenever you think of a possible topic, write it down in your idea file for future reference. Personally I keep my idea file on my Ipod Touch for future reference. Look to books on the topic for inspiration: Go to Amazon.com and search for books in your subject matter. Look to popular books in that niche, and see what they are about. Consider writing about those topics. Also look to the comment areas to see what people still are looking for information about – or what certain books were lacking. Amazon can be an invaluable resource for this type of information. 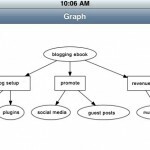 Mind mapping: Come up with a general topic to write about, and then do a mind map as suggested in this post on how to write an ebook. (see a screenshot of one of my mind maps above) This can help you to come up with many post ideas at once – even a whole series! Do keyword research on a general topic: Figure out a general topic that you might want to write about, and then do some keyword research to narrow down the topic a good subject for a post. Ask yourself what information you would find useful: One thing that I find always brings about some of my best posts are the ones where I just think about what information I have searched for on Google for answers in the past. If I was looking for information on how to start a blog, what topics have I searched for in the past? Free writing: Just start writing about whatever comes to mind. Usually one idea will lead to another and before long you’ve got a post! So those are a few of the main ideas I use to get the creative juices flowing again. It usually just comes down to searching for ideas in new and different places, free associating off of those ideas and coming up with new ideas for content – or putting my own spin on an old idea. Do you have your own ways that you get the creative flow going? Tell us what you do to come up with content in the comments! What Blogging Platform Should I Use For My Blog? Over the years there have been a wide variety of platforms developed to make the process of blogging extremely easy, to the point where just about anybody can publish their own regularly updated website. There are both self hosted blogging software and hosted blogging services that you can use. Both have their pros and cons, and a variety of services are available for each – some free, and some which will cost you money to use. So which blog platform should you choose? Using a self hosted option means that you’ll need to purchase a web hosting package, update your own software when updates come out, and that you’ll have more flexibility when it comes to choosing a design, adding advertising to your site, etc. It also means more hassle sometimes because you’ll need to maintain your own software and hosting package. WordPress.org: This is the one that I use, and it is quickly becoming the industry standard for those who take their blogging seriously. It is a free software, but it does require that you have a web host, and some basic know how or help to setup. Thousands of custom themes and plugins are available for the software. Movable Type: Another self hosted option and free download. I haven’t used it but by all accounts it is relatively easy to setup as well. Drupal: Another free content management system and blogging tool that has tons of add-on modules. More difficult to use by some accounts. Using a hosted blogging service means that the software, updates and hosting are all taken care of by a third party service. This means that there will be less maintenance tasks, less need to know details about hosting accounts/etc and less cost as many of the services are free. Unfortunately using a hosted blogging service also will limit your options when it comes to making changes to your site, adding ads, and in some instances can mean you don’t completely own the content. WordPress.com: This is similar to the WordPress.org self hosted software. The difference is that it’s hosted on the WordPress servers, and your options when using it are much more limited. If you’re looking to make money from your blog, advertising options on WordPress.com are extremely limited and restricted. Blogger.com: A free blogging service that I actually started out blogging on when I started blogging seriously in 2008. Great to try if you’re just getting your feet wet and not sure if you’re in it for the long run. I have however heard horror stories of people’s blogs getting shut off for little or no reason by Google – with no explanation. For that reason alone i might steer clear. TypePad: A paid blogging service starting at $8.95/month and that allows customization via themes. No experience with it, but some seem to like it. Tumblr.com: Another free blogging software that is easy to setup and use, but will limit your options if you’re serious about making money from your blog. It’s more of a micro-blogging software for shorter posts. Which Blogging Platform Is The Best? That’s not to say that the hosted blog options aren’t popular, because they are. Many of the top 100 sites use hosted blogging services for their blogs and do quite well with it. Personally I prefer using a self hosted option because the pros outweight the cons. Pro – Cheap, affordable or free: Most hosted blogging services are going to be either free or very affordable. Blogger and WordPress.com are among the most popular, and are both free. Pro – Ease of setup and use: Using a hosted blogging services is usually pretty easy, and there isn’t a lot you need to do to set it up and keep it running. Pro – Updated automatically: To me this is one of the selling points of blogging services – that they’re updated automatically and there is no need to maintain your site on a regular basis. Con – Less configurable: In general hosted blogging services have more limitations and are less configurable when it comes to plugins, add-ons and making the software do something beyond the basics. Con – Less control: In general when you’re hosting your site with a 3rd party service, you have less control over your site. You’ll have to abide by their terms and conditions – and if you don’t – you can have your site turned off or deleted! Con – Generic subdomains: Having your site at a subdomain off of a blogging service looks amateurish at best, and isn’t the best option if you want to make money from your site. Con – Moving to self hosted later can be difficult: One thing I regretted was starting my site at blogger.com because it made moving to a self hosted version of WordPress later on a difficult chore. I had to export hundreds of posts, images, and a ton of other stuff. Do yourself a favor and start where you wont’ have to move. Pro – Full control of design: You can put up whatever theme you’d like on your site, make changes to themes, add ads, etc. You can basically do whatever you want – and you’re only limited by your skills and creativity. Pro – adaptability and extensibility: WordPress has a huge community that has developed hundreds of plugins and additions for the software, making it extremely flexible. Pro – free platform with free upgrades: The software is free, as are all the updates! Pro – Your own URL: While you can get your own URL at a hosted blogging service, you really HAVE to with a self hosted blog. And you SHOULD have your own domain name. Con – Complicated setup: Setup of your blog and custom themes aren’t going to be as simple as with a blogging service, especially if you want to do something a little different. Con – Cost: I spend several hundred dollars every year on hosting my sites, domain names and other miscellaneous costs associated with having a self hosted blog. On the flip side, I make thousands. Con – Maintenance: With a self hosted platform you have to deal with updating the software every time a critical security update comes out, or update your plugins when they get updated. And heaven forbid if something go wrong with one of your updates! Con – Learning curve: When first starting out with a new blogging platform there is a lot of stuff to learn. That’s why blogs like this one exist! So there you have it, for me the pros of a self hosted platform – control, flexibility and extensibility – outweigh the cons of having a learning curve, cost and maintenance issues. Darren from Problogger.net said it best I think, and sums up how I feel about which platform works the best for a money making blog. If you’re wanting to develop serious blog and have aspirations for it to be used on a professional sort of level (whether as a business or corporate blog, as a blog to build your own profile or a blog to earn income from advertising) I’d recommend you go in the direction of a stand alone blog. Even if you are not highly skilled in this area it’s worth spending a little money to get it set up with a designer or even better still, to learn how to do it yourself. So my suggestion? WordPress.org self hosted blog software. You’ll be glad you did. So now I’d like to open it up to your thoughts a bit on the topic. What content management system or blogging software do you use? Are you happy with it? Have you switched at any point? If so, why? Want To Build A Nice Second Income? 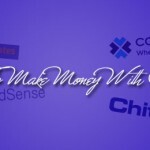 How To Make Money With A Blog Aims To Help You Do Just That. Hi, my name is Pete and I blog as a second job. A while back I started a WordPress blog about personal finance. I started writing the blog because my wife and I were taking a class called Financial Peace University, done by finance guru Dave Ramsey. As part of the class I kind of wanted to track what we were learning so that I could refer back to it later. After writing for the site for several months I started to realize that a lot of other people were reading the site besides just me – and I quickly realized that you could turn a blog into a cash making machine if you did things the right way. Here we are almost 3 years later and my blogs are now almost equaling the income from my day job, and they have long since eclipsed the income my wife was making before she became a stay at home mom. Having a blog is an amazing way to create a side income, build a little extra financial security or even create your own ideal full time job. On this site I will be writing about a wide variety of topics surrounding the topic of blogging – and specifically focusing on ways to make money blogging. It took me a long time to figure out a lot of this stuff, and now I want to start sharing it with others so that they can shorten their own learning curve. I’ll be looking at things like how to have good SEO on your site, blogging tools that can help you to optimize your site, best practices for using Google Adsense, monetization strategies and more. I hope you’ll join me on this journey, and comment when you have questions – or always feel free to contact me via the contact form linked above. Also, if you want to jump right in, I do have an ebook available right now that goes in depth on how I created my money making blog, and how you can duplicate my success. The ebook has the same name as the blog, “Blueprint For How To Make Money With A Blog“. Just click on the banner in the right sidebar to get more details or purchase it now!